Comic books are the ideal medium for exploring the prehistoric period when dinosaurs ruled the Earth. Unlike film, comics don’t require millions of dollars of special effects to bring these creatures to life, and skilled cartoonists can immerse readers in the setting and tell emotional stories about survival without anthropomorphizing the animals. After drawing modern reptilian characters like Godzilla and the Teenage Mutant Ninja Turtles, Tadd Galusha is going back in time to explore the world of dinosaurs through a less fantastic, research-based lens in his new Oni Press graphic novel, Cretaceous (on sale March 13). 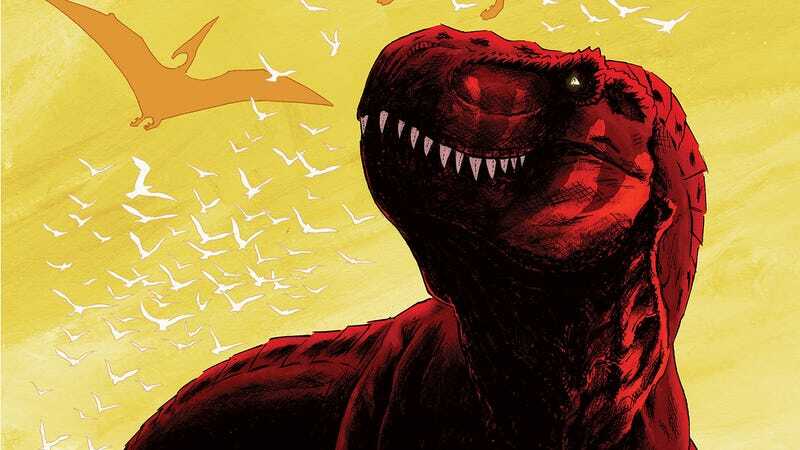 In a similar vein as Ricardo Delgado’s Age Of Reptiles series, Cretaceous is a text-free comic that finds horror, excitement, and triumph in the everyday struggles of these majestic beasts, focusing on a Tyrannosaurus Rex left to roam the dangerous landscape on its own after the loss of its partner. This exclusive preview highlights that danger as it shows a pack of Albertosaurus Sarcophagus taking down the T-Rex’s companion in a bloody, brutal attack. The opening pages of this excerpt use shadows to create an atmosphere of suspenseful dread, and by going off on its own, the central character leaves its friend vulnerable to fellow carnivores looking to take out the competition. Galusha’s illustrations of dinosaurs in action are full of intense energy, and his slanted page layout adds an extra sense of motion to the scene before the fight explodes in a ferocious two-page spread. The proliferation of bones throughout the book reinforces the kill or be killed nature of life in this environment, and the beauty of the natural setting contrasts with the grisliness of its inhabitants. Things will only get tougher for the T-Rex now that it is alone, and Galusha’s emphasis on the perils of prehistoric life gives Cretaceous a chilling dramatic foundation.